Ok, this is badass. I admit that most emails I get from MLB, I just make fun of. This one, however, has caught my eye. Love it. Love baseball. Love Field of Dreams, the movie. Love combining the two. Brilliant marketing. Before I get into how awesome this marketing campaign is…How about you test your baseball knowledge? Click on the picture above, and see if you can name everybody and the team they are on. Don’t cheat, that’s lame. I’m gonna start….now. Anybody get ’em all? I missed one. Harold Baines. Whatever. 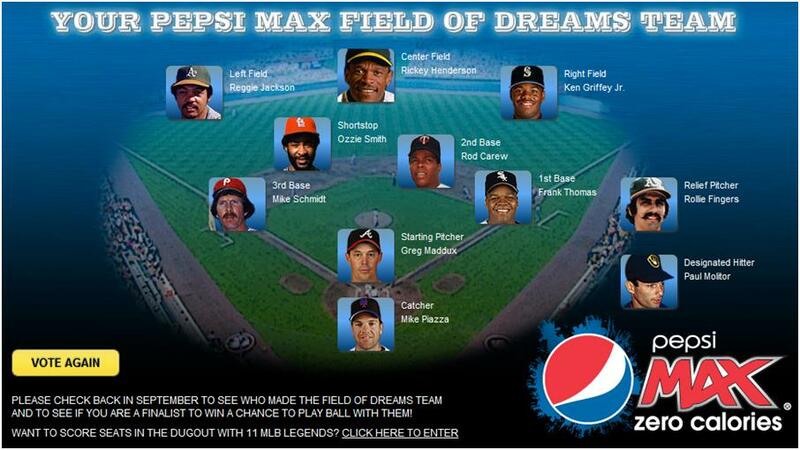 Here’s where you can check the players, and see how the promotion/contest works: MLB Pepsi Max Field of Dreams. Go vote. Go enter. (no this is not a paid promotion) There’s a ballot of 30 players and you pick one of three at each position to be on your team. The winner gets to play this team, in your hometown, with 10 of your buddies. Are. You. Kidding. Me? Best promotion ever. Just awesome. You and your jackass friends playing a baseball game against a bunch of Hall of Famers. Yes, please. Only stipulation, if any of you lobsters win, I’m on your team. I basically just picked all the dudes I’d want to hang out with. Had nothing to do with who had the better career, etc. Just who I thought would be fun. My fellow Padres fans with flip I didn’t pick Gwynn… whatever… love Tony, but he’s boring compared these cats. Crazy thing…of the 30 players on this ballot, 9 were Padres. Rollie Fingers, Goose Gossage, Steve Garvey, Ozzie Smith, Mike Piazza, Greg Maddux, Dave Winfield, Rickey Henderson and Tony Gwynn. “Rickey wins again!” I re-watched that like 9 times just to watch Rickey Henderson playing himself in Ro-Sham-Bo. “Rickey wins again!” Love it. Now go vote! Go win! Pick me! Pick me! This entry was posted in Baseball, MLB and tagged Baseball, Contest, Dave Winfield, Field of Dreams, Goose Gossage, Greg Maddux, Mike Piazza, MLB, MLB Pepsi Max, MLB Pepsi Max Field of Dreams, Ozzie SMith, Rickey Henderson, Rollie Fingers, Steve Garvey, Tony Gwynn. Bookmark the permalink.